Tomorrow I am driving the three hours home to my parents’ house for Christmas. I am excited to be in a house with a Christmas tree. I’m excited to finish my Christmas baking in my momma’s big kitchen. I’m excited to hunker down and watch Tangled with my momma on Thursday night (and maybe my daddy, too, but only if we can convince him that it isn’t too girly…). Pause: Let’s just take a minute to talk about how my life was revolutionized last weekend when my friend Erin made me watch Tangled for the first time. Now, I’m kind of a classic Disney snob. I love the old animated movies with lots of singing and cute animals and totally unrealistic romantic scenarios. LOVE. (Again, no judgement, please! You know you have your guilty pleasures, too.) I was unconvinced that a new movie could live up to my expectations, but Erin made a believer out of me. Also, Aladdin used to be my one and only Disney crush. I think there is a good chance he is being edged out by Flynn Rider. Watch the movie. Trust me, you’ll understand. So, now that I’ve totally outted myself as the world’s biggest nerd, let’s talk about these cookies, ‘kay? 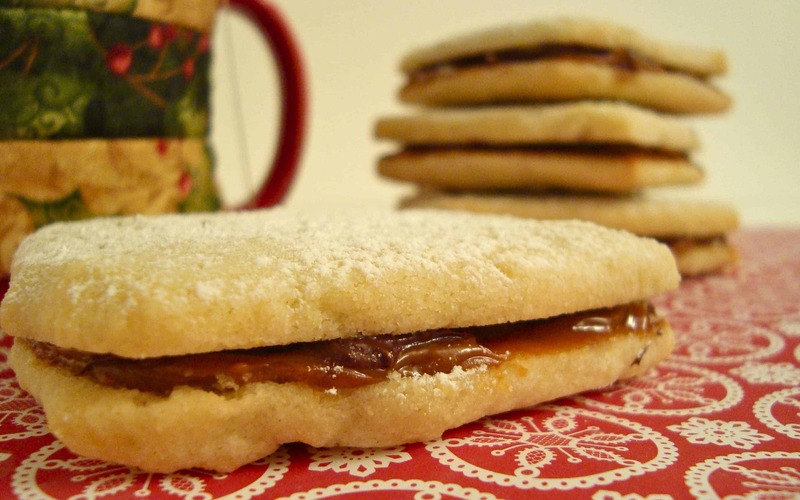 Dulce de leche alfajores are a traditional South American cookie, and there more versions of them than I can even count (but, then again, I stopped doing math immediately after my calculus final in high school – math is haaaard). 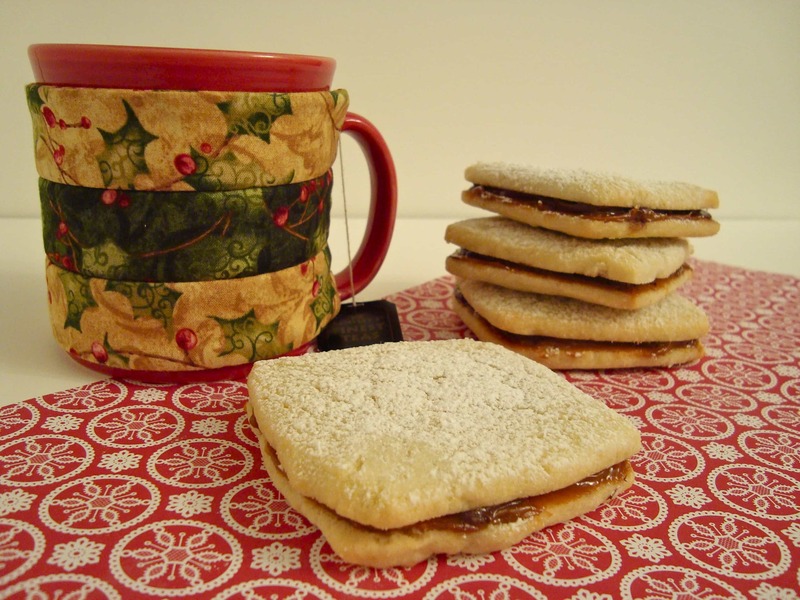 These are a lightly citrus-flavored butter cookie, between which is sandwiched a layer of melted chocolate married with a layer of dulce de leche. I described dulce de leche to my mother as “condensed milk on crack”. 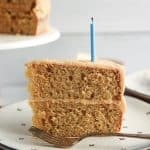 It’s caramel-y and thick and super sweet. It’s the perfect thing to pair with a crisp buttery cookie and some chocolate. Of course, we all know how I feel about chocolate, so I did not try the finished product, but one of my taste testers reportedly tried one and immediately said, “Oh dear, I’m going to need to go to the gym tomorrow.” Sign of a good cookie, right there. 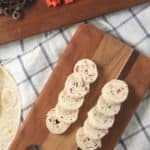 One thing to be said about this dough: you definitely do not want to skip the chilling step on this recipe. I know, I know, chilling cookie dough can be a real pain, but this dough has quite a bit of butter in it, making it absolutely necessary to chill it for the full amount of time. You will want to re-chill your scraps as you work, too, as the dough softens quickly. Even though the recipe says to use cookie cutters, I ended up measuring out 2 1/2 inch squares and cutting them that way instead. These buttery nuggets of goodness are totally worth the small hassle that the soft dough presents, though – lightly citrus-y, crisp, perfectly buttery…they don’t even need the filling to be completely delicious. Make these. Enjoy them with a nice cup of tea next to a roaring fire. Leave the tea bag in to steep forever. 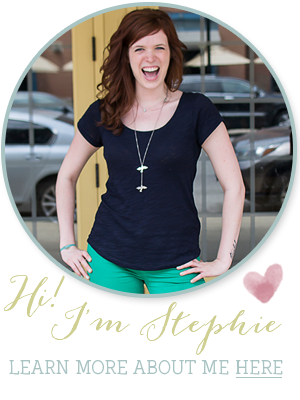 Pretend you’re in South America where it is warm instead of in the snowy Midwest. Oh wait…that’ll just be me. 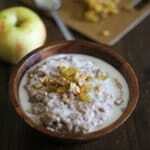 In a large bowl, beat butter with an electric mixer on medium to high speed for 30 seconds. Add the sugars and salt. Beat until combined, scraping bowl as necessary. Add egg, orange or lemon zest, and vanilla; beat until combined. Beat in almonds. Beat in as much flour as you can with the mixer, stirring in the rest by hand (if using a stand mixer, you will be able to do this all with the mixer). Divide dough into three portions. Wrap in plastic wrap and chill for about 2 hours or until dough is easy to handle. Preheat oven to 350 degrees. 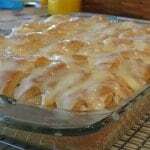 Lightly grease or line a cookie sheet with parchment/silicone baking sheet and set aside. 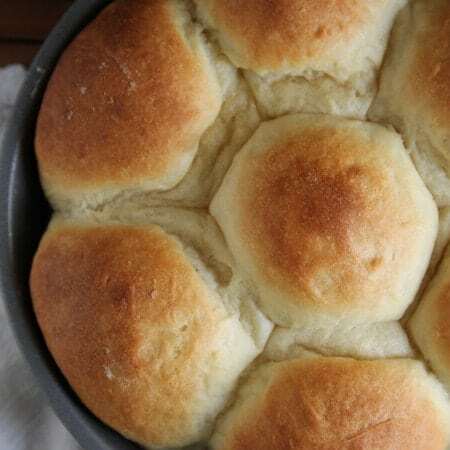 On a surface lightly dusted with powdered sugar (NOT flour), roll one portion of the dough at a time to ⅛ to ¼ inch thick. 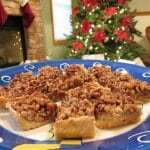 Using a round or square 2 to 2½ inch cookie cutter, cut out dough. Place cutouts 1 inch apart on prepared cookie sheet. Bake for 8 to 10 minutes or until tops are very light brown. Carefully transfer to a wire rack to cool completely. 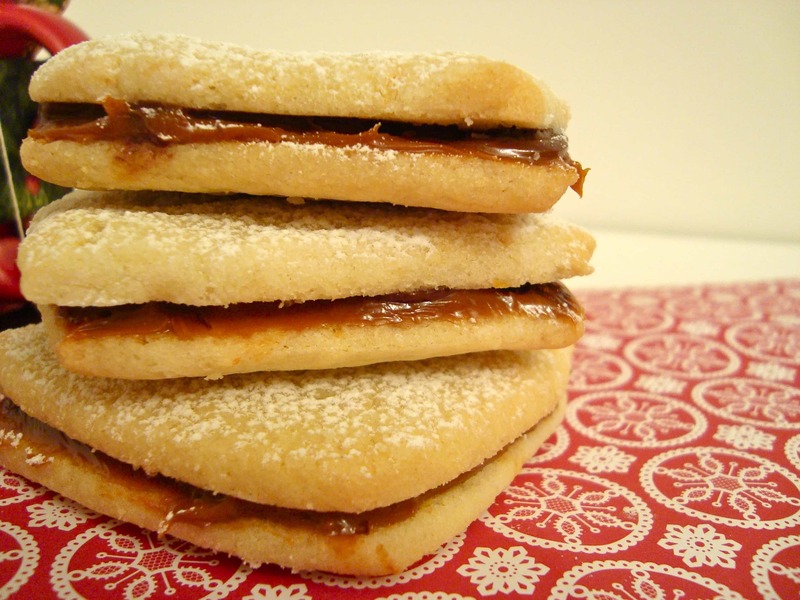 Within 2 hours of serving, spread 1 rounded teaspoon of dulce de leche on the bottom of a cookie. 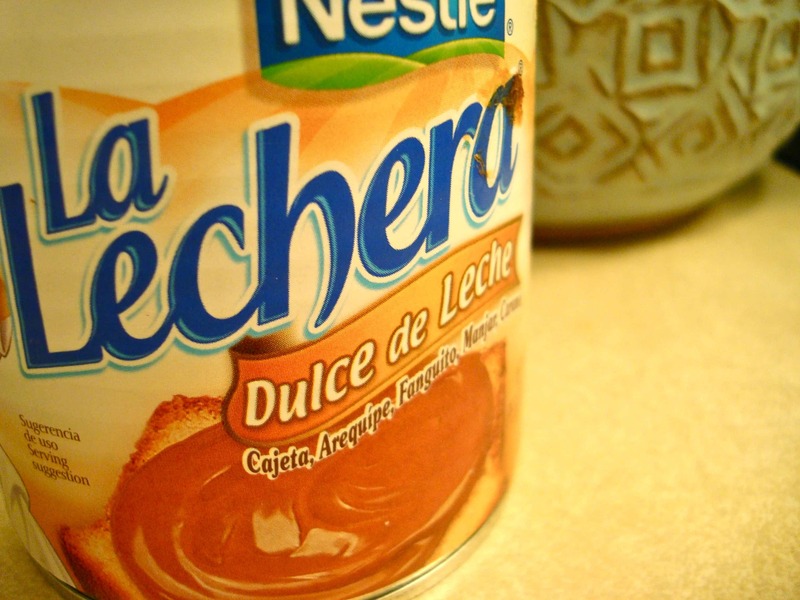 Spread about 1 teaspoon of the melted chocolate over the dulce de leche. Top with another cookie, bottom side down. Repeat with remaining cookies. 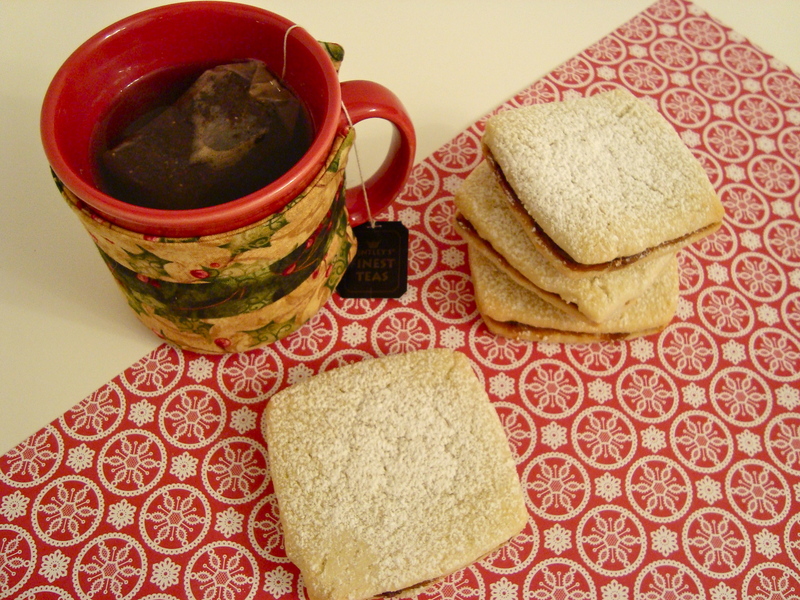 Dust tops with additional powdered sugar. 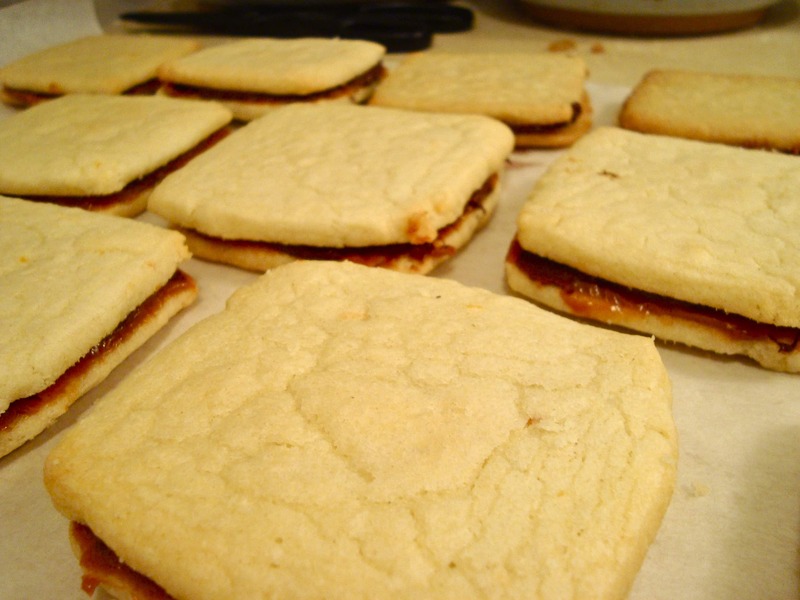 To store: Place unfilled sandwich cookies in a single layer in an airtight container; cover. Store at room temperature for up to 3 days or freeze for up to 3 months. To serve, thaw cookies before filling and garnishing. Oh my how I love alfajores! I spent some time in Peru one summer and we would visit this bakery on the corner every afternoon and get alfajores. 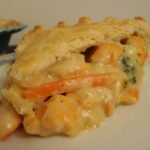 I haven’t yet tried to recreate them, but this post is motivating me! Have a wonderful Christmas!!! These cookies look amazing. I love anything with dulce de leche. Yum! I really would eat my heart out if I had a plate of these beautiful cookies in front of me – the-path-to-bigger-jeans never looked so wonderful!